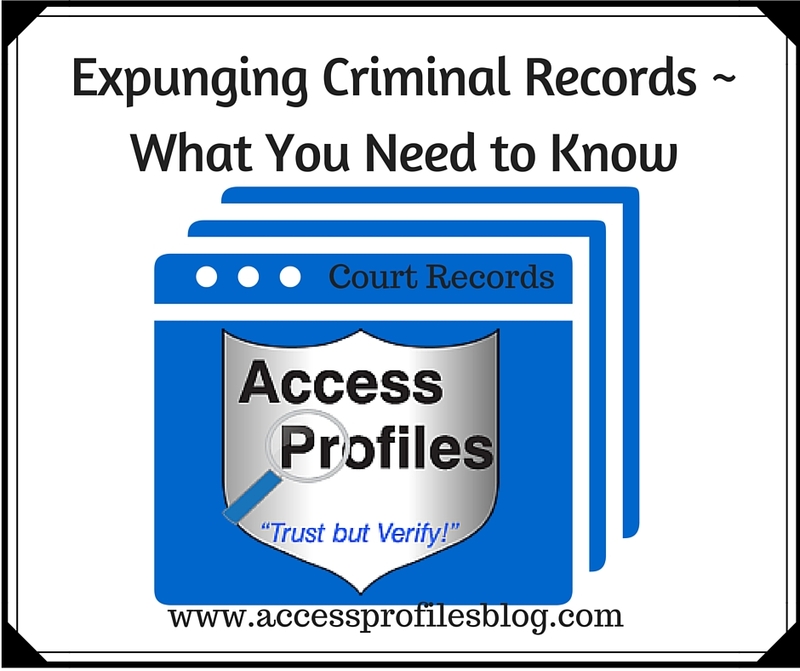 What You Need to Know about Expunged Records and Hiring! Having a criminal record, even for a one time offense, can have serious consequences on a person’s future. It can impact their ability to rent an apartment or own a home, get a student loan, and even to volunteer in their child’s school. However, the most serious problem for an ex-offender is finding a job. There are many employers that steadfastly refuse to even consider hiring someone with a criminal record, despite laws designed to give these offenders a second chance. 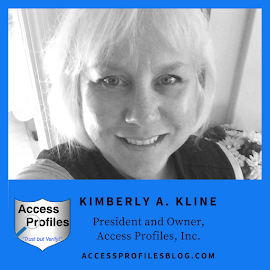 Regulations stemming from the Fair Credit Reporting Act (FCRA), and set as guidelines by the Equal Employment Opportunity Commission (EEOC), address this issue of criminal records and employment. These laws seek to delay the background check and restrict how far back an employer can go when considering a past criminal record. Some states are looking to go even further. These states are passing legislation that will expand the ability of ex-offenders to have their record expunged. Many believe it is a way to give an ex-offender a second chance. Others feel it is simply a way for those convicted of a crime to hide their past. Many of these laws have even expanded the types of crimes permitted to be expunged. Most states restrict it to those who have committed non-violent felonies and misdemeanors. This includes such offenses as vandalism and criminal trespass. All of these states require that the terms of the offender’s sentence must have been completed and, in order for an expungement to be granted, for there to have been no additional offenses for a determined number of years. Proponents believe expungements are a way to prevent a minor criminal from continuing to be plagued by their past. The goal is to get them back to work and decrease the chance that they will re-offend. Despite these good intentions, expanding the ability to expunge past crimes is also cause for concern. Questions arise as to what some state legislation considers a non-violent offense. In Kentucky, for example, cases of reckless homicide, stalking, torturing animals, or even assaulting a police officer can be categorized as non-violent. Another worry is that the nature of the crime, or any possible special circumstances surrounding that crime, has no bearing on whether an expungement is granted. Many states give judges no discretion to consider anything other than whether the ex-offender meets their state’s expungement criteria. Also at issue is the lack of communication among states and localities. It is conceivable that a person who has been granted an expungement in one state, can then go on to commit a crime in another state. Then, upon meeting that second state’s criteria, can be given another expungement. Because of the original expungement, there would be little chance of a link existing that shows this person has re-offended. Even legally obtained expungements do not always keep past criminal records from surfacing. It is not practical or realistic to believe that these records will automatically be removed from all databases in which they exist. 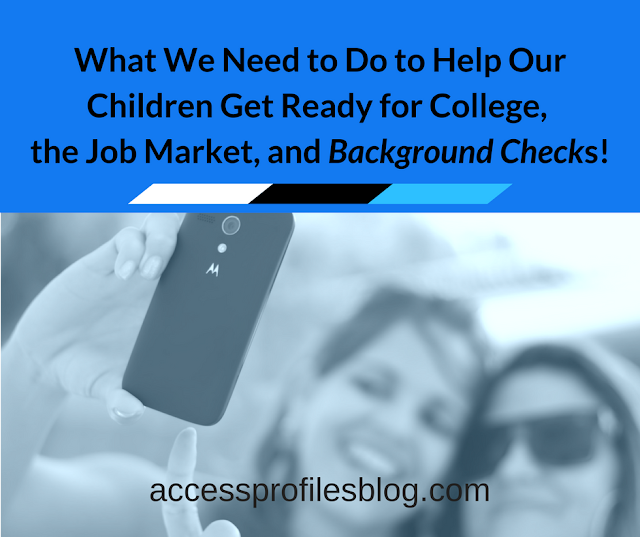 As a background check provider, I am expected to avoid reporting any record that has been expunged. Because I use direct court records to generate my report, this requirement is a little easier. However, screening services that either maintain their own database or use another online database to research criminal records can fun afoul of this law. When the expunged record has not been removed from the database and it is included, these companies are not assuring the maximum possibly accuracy in their report, as required by the FCRA of all background screening services. Opponents also worry about keeping a criminal record from employers. 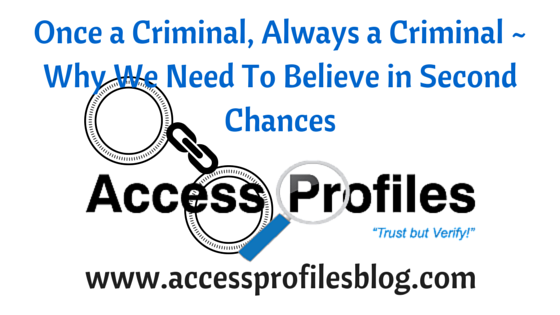 They believe that a employer should know their applicant’s criminal history in order to make an informed hire. I believe in second chances. Making a mistake, especially a one time mistake, should not keep you from having a future. And there is no better way of helping someone earn a future than by giving them a job. Read more about this in, “Once a Criminal, Always a Criminal ~ Why I Believe in Second Chances”! However, I also believe that employers should have all the information possible to make an informed hiring decision. Expunged records will only make the hiring process more problematic. Current laws already limit how, when, and why a criminal record can be used to determine employment. The EEOC requires you, as an employer, to differentiate between arrests and convictions, wait to run a background check until a conditional offer of employment and, if a record is found, examine that record on a case by case basis to see if it should prohibit you from hiring them. And in many cases, a criminal history cannot be used to deny employment unless it is relevant to the job. In addition, guidelines limit the records that can even be considered to the past 7 to 10 years. In effect, these existing EEOC and FCRA guidelines already make a long ago record, arrests, or minor offenses irrelevant to hiring. Find out more about these laws here! It is also important that you know your applicant’s criminal history so you can determine if they are safely able to do the job. And that means knowing if their criminal past could pose a threat to you or your company. There is also the question of employer liability when hiring someone with a criminal record, whether you know about it or not. Lawsuits where the employee is held liable for the behavior of their employees are not unheard of. Using expungement as a way to act as if a person’s criminal record NEVER existed is not the answer. I think that instead promoting expungement, the best option is to fully enforce existing FCRA and EEOC requirements concerning criminal backgrounds and employment. The current screening laws need to be more vigorously monitored and, if infractions occur, employees should be held accountable. This includes laws concerning banning the box, individual assessments, and applicant rights in employment background checks. This would help ensure that ex-offenders are being given the chance to become productive and successful. And there is no doubt that having a job goes a long way towards accomplishing that goal. Instead of expanding expungements, there is also a better way to address employer liability. It starts with giving employers immunity from prosecution for hiring someone with a criminal record. Knowing that you will not be held accountable goes a long way towards giving you the peace of mind to take a chance on hiring an ex-offender. Increasing the number of programs that teach convicted criminals needed job skills are equally as important. It is also crucial to form partnerships with companies willing to hire these trained ex-offenders. These ideas only work, however, if you are able to hire with the full knowledge of your applicant’s criminal past. Then you can be more careful where you place these employees and that you monitor them more closely. This gives ex-offenders a second chance to prove themselves without putting your company in jeopardy. Whether or not expungement rights exist in your state, as an employer, you should consider periodically re-screening your existing employees. This can help protect you in case your employee either re-offends or offends for the first time. Discover more about re-screening your existing employees here! If the ability to expunge records is available, it shouldn’t be done with the “one size fits all” approach. Using the idea of individual assessments instead makes sense. This would allow judges to look at each request on a case by case basis. It would be wise to look at what the ex-offender has done since committing their crime. Have they taken any steps to try and better themselves? It is also crucial to be vigilant about checking for any other instances of criminal behavior, and not just in the court where the last offense occurred. These steps can work beyond the arena of employment and into the areas of student loans, voting rights, home ownership, and many others where having a past criminal history impedes future rights. Taking the time to look at each case individually, instead of making blanket assumptions, makes sense. People need to be held accountable for their actions, but we also need to recognize and reward efforts of rehabilitation. We, as people, will be better for it! Please Share this article and Leave a Comment. We would love to hear your thoughts! I will give you the tools you need to navigate the world of hiring and background checks. 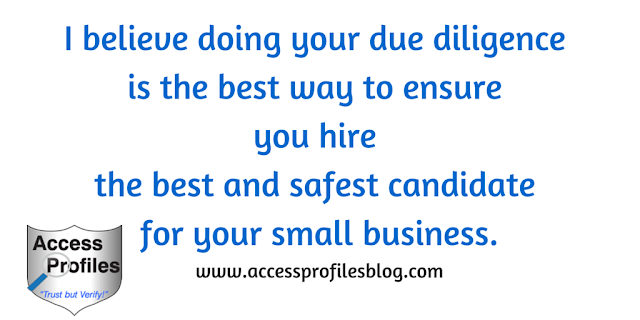 API Can Help You Hire Safely! Discover more About Us and Our Background Investigation Services too! Thanks!